Vancouver Island has a large selection of key areas for you to explore. Ocean Wilderness Country (North Island), featuring Port Hardy and Port McNeill. 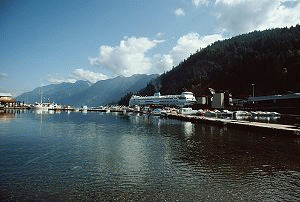 Telegraph Cove near Port McNeill is the birthplace of whale watching. Port Hardy is the terminus of the Prince Rupert ferry. Fishing Paradise (North Central Island), featuring Campbell River, Comox & Courtenay. Campbell River is the sport fishing capital of BC, famous for its Tyee (Chinook salmon that are more than 13.5 kg (29.76 lbs.). Oceanside (Central Vancouver Island), featuring Qualicum Beach, Parksville & Nanaimo. Parksville/Qualicum is famous for its beaches and scenery. Nanaimo may have an amazing dessert named after it, but has much more than that to offer. Pacific Rim, featuring Port Alberni, Tofino, Ucluelet & Bamfield. Whales, storms, Long Beach and some of the most amazing views in the world await the traveller. Cowichan, featuring Duncan, Ladysmith and Chemanius. On the drive from Victoria to other areas of the Island, don't miss the totem poles in Duncan, the murals in Chemainus and the sheltered harbour of Ladysmith. South Island, featuring Greater Victoria BC and Sooke. The Gulf Islands, featuring unique islands from the northern Malcolm Island to the better known Saltspring Island in the south. Mills Landing is a private oceanfront cottage resort located on the West Coast of Vancouver Island. We are on the southern edge of Barkley Sound in the little town of Bamfield. This area, without question, is one of the most productive marine environments in the world. We have some of the west coast's best fishing right on our doorstep. We are located on Vancouver Island near the Chemainus River with the ocean nearby. The resort is a fisherman's paradise and an excellent vacation spot. RV accommodations include: campsites with full hook-ups: 75, campsites with partial hook-ups: 57, campsites without hook-ups: 28. We have a laundromat, recreation rooms, country store, heated swimming pool, horseshoes, arcade, mini-golf and bingo. Beaver Lake Resort is the only full service destination resort in the Cowichan Lake area. Our guests enjoy a wide variety of camping choices from a full service RV campsite, a shady tent campsite to a fully self contained cabin. Whatever your camping desire is, we have it waiting for you. Not only do we have GREAT campsites we also have flush toilets, free hot showers plus much, much more. Nestled in the scenic Mill Bay, only 30 minutes north of Victoria, Rosebank Cottages offer a postcard setting with picturesque privacy and superb surroundings. Beautifully landscaped grounds with a quiet, country feeling, magnificent sunrises and lovely ocean views from all cottages. Come enjoy a peaceful and relaxing holiday in your private vacation cottage on the beach. The Skylite Motel is a perfect place for Parksville accommodation and lodging, with all of our amenities and services, for you and your family to relax at, once you have finished your busy day. Call us directly 1-800-667-1886 or travel further through our website to discover the many valuable accommodation services we can offer you. Discover yourself in Parksville, BC, where hospitality comes with a view. The Bayside offers beachfront accommodation, ocean views and great food all in one location. Sleep in. Beachcomb. Golf. Keep fit in the cardio room, heated pool or racquet courts. Enjoy casual gourmet dining overlooking the bay. We offer great getaway packages or create one of your own. There is always a lot to do. We offer beach-front vacation accommodation rentals in Parksville, 20 miles north of Nanaimo. All units face the ocean and overlook the beach. Choose between two-bedroom beach-level units that open onto the beach, or one-bedroom and studio ridge-level units, with beach access. Beach-level and ridge-level units enjoy spectacular views of the Georgia Strait and the Sunshine Coast. Stay in our Parksville motel and see why it is consistently recognized as a preferred accommodation on Vancouver Island. We are CAA/AAA approved, centrally located with large, very soundproof rooms, comfortable Queen or King beds. Large TVs, free high speed Wireless Internet, Refrigerators and coffee-makers in all rooms. Full kitchen, air-conditioned. laundromat and large playground. Pet Friendly. Unit 21 1165 Resort Dr. This 14 unit resort is situated on 4 acres of beautiful oceanfront property. Each unit has a fully equipped kitchen, gas fireplace and large balcony either overlooking the ocean or pool. The amenities include a heated outdoor pool, playground, indoor hot tub, sauna and laundry facilities. We are located on the east coast of Vancouver Island next to the old-growth forests of Rathtrevor Provincial Park. Parksville offers shops, cafes, restaurants, grocery and specialty stores, only a 2-minute drive away. Quaint Qualicum Beach is only 10 minutes further. Our cottages are custom-designed and quality-built with a recreation centre that has an indoor pool, hot tub and exercise room. Located in the heart of our Parksville. Take a short stroll to the beach, enjoy our scenic attractions or browse through local shops. Experience our comfort! We have air conditioning, complimentary coffee, juice & muffins each morning, in-room coffee, free movie channel, children under 12 stay free, laundry facilities, barbeque area, meeting room, kitchenettes available, non-smoking rooms.